Home › Writing › The Patron › The Patron Part 9! Since it’s Mother’s Day and I was requested by a mother (not my own) to “hurry up”… (I think she might have sworn more, it was all very threatening) and get some more of The Patron posted.. here we go. The last slice of ridiculous delight saw our hero, The Patron, announcing himself to guards of a ship to save himself the trouble of getting on board. He’s still angry about what happened to his brother, and down below there’s a man he’s going to make sure pays the price. So here it is! 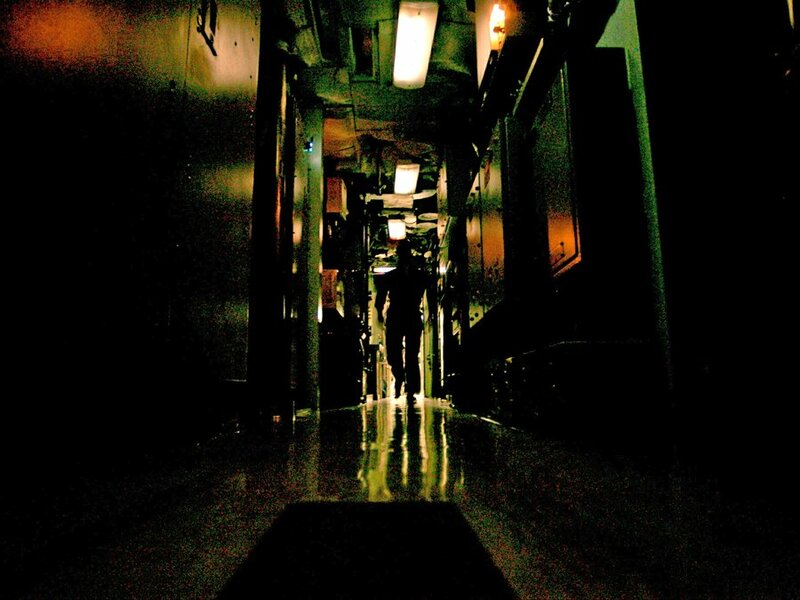 They walk The Patron up and into the ship, right into the belly of the beast. He can hear rattling in the pipes, like hell had been bottled up and run through the veins of the ship. His own hell was down below. He has tried to find it for years. The grip on his right arm was tight, like a vice. A giant of a man walked beside him, all muscle and scowl with a knife scar ripping straight down over his nose. The hold on his left was loose. The Patron figured he could shake that guy easy. That would leave the giant though. It would also leave the guy behind him with the gun. There was no point causing trouble. They were taking him where he wanted to go. “You’ve made a lot of people very unhappy tonight Patron,” the goon behind him says. The patron doesn’t respond. The fool’s not worth the breath. Finally they reach the end of the corridor, a door opens with a screech of protest. Three more hired muscle stand on the other side, fingers resting on the triggers of Kalashnikovs that hang from around their neck. The Patron could dodge free of lefty, grab the gun, take out the big guy and use his body as a shield to finish the rest. It’s tempting. The muscles on The Patron’s left arm twitch. The grip on his right arm tightens. “Don’t,” the big guy says. Not just a pretty face obviously. If The Patron risked it he might just run. He’s run before. This time it’s all or nothing. Finally they’re ushered down into the heart, past the throb of crews at work and into the engine room which pulses with steam and sweat. 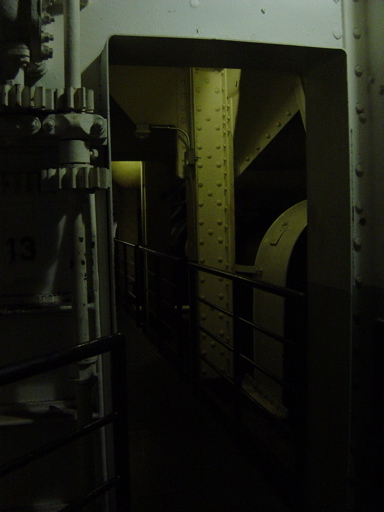 The lights are run low, adding darkness to the weight of the metal pressing down from above. He’s playing it smart it seems. Even if The Patron gets a gun there’s no clear line of sight and it would probably be suicide to dance bullets in here. Being smart was never his problem though. Doing the right thing was. “Hello Patron,” a voice emerges from behind the steam. “You wanted to talk to me?” It’s not him. “You must be chief goon,” The Patron says, spitting to one side to clear some blood from his mouth. He thinks maybe he killed the big guy’s boyfriend out there in the stacks. He was pretty thorough as he frisked for weapons. “I’m who you will be talking to,” the man who has been waiting replies. The Patron shuffles forward, mirrored by the meaty shackles on each side. The speaker steps into the light. “I thought I’d maybe say hello first, check everything is ok you know? The boss is a busy man,” Dave says, walking towards The Patron. He shrugs off the pin stripe jacket of his suit, handing it over to one of the thugs with a gun. That’s one gun down at least. Dave takes off his cuff links slowly, placing them in his pocket, then rolls up his sleeves. His hands are quick, methodical as he frisks The Patron again. He sees the wince as he runs over The Patron’s ribs but he doesn’t press like the big man did. Dave’s a professional like these fools wouldn’t even understand. Finally he’s happy, he steps back so the light’s behind him, shining straight into The Patron’s eyes. “Send the coward out then,” The Patron whispers, fierce through gritted teeth. There’s a pressure behind his eyes now. It’s history, and the memory of his anger. It’s all the anger he’s still got bottled up for the years he’s lost. Blood’s rolling down through those gritted teeth, down over the side of the Patron’s mouth, “I want to look him in the eye before I kill him.” The big guy squeezes tighter. Laughter emerges from the shadows. There’s a tap of something metal hitting the floor, a wheeze and then a pause, another tap, another wheeze and the outline of a figure can be seen moving closer. The Patron knows who it is. He knew he’d be here, now he thought he’d won. The laughter starts up again, a crackling burst of scorn that slinks out from the darkness. There’s another tap, then a spluttered cough. He emerges into the light. He’s wearing a dark suit of his own, the red lining fluttering from the draft thrown off by the engines. He leans heavily on a silver cane, topped with a lion. “Hello Brother,” he wheezes, smiling wide.